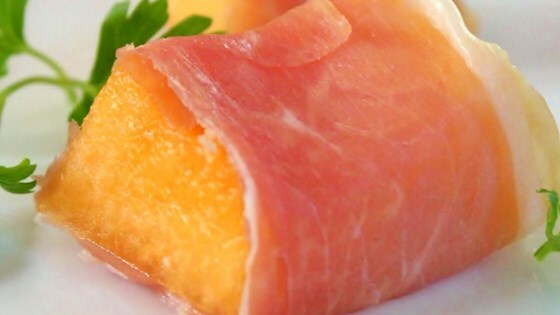 "This easy and refreshing starter featuring cantaloupe and cured ham (Parma ham for instance) can also be served as an appetizer: just cut the cantaloupe into bite-size pieces, wrap them with ham and spear them on skewers for a colorful snack! Use superior quality Italian ham for best results." Easy, elegant appetizers are topped with fig jam, prosciutto, and Cheddar. basalmic vinager is a great addition!! !